SBC Plodder: Has anyone seen one of these "Cooperative Agreements"? Has anyone seen one of these "Cooperative Agreements"? Two summers ago I made a long trek to St. Catherine’s monastery in Sinai. 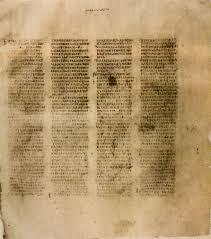 It was a great thrill to gaze upon some leaves of one of the greatest of all Bible manuscripts, the Sinaiticus. My old greek prof would invariably affix the adjective “Great” when mentioning it. Of course there’s an easier and closer way to see it – go to the British museum in London where the bulk of the document resides but you miss the aura of the old monastery, Tischendorf, musty old buildings and ancient icons of St Catherine’s. The most significant practical part of the Great Commission Resurgence Task Force’s recommendations has to do with some venerable documents of North American Mission Board, the ‘Cooperative Agreements’ with state conventions by which some $50 million or so of Cooperative Program and Annie Armstrong dollars are kicked back to states. The GCRTF, much to the chagrin of lots of folks, recommends ending these agreements so that NAMB can control their own budget. Well, I’ve seen what is perhaps the greatest of the ancient Bible manuscripts but I cannot see one of these Cooperative Agreements. I asked my state convention whose finance guy kindly replied with a somewhat helpful description of our Cooperative Agreement. The Georgia Baptist Convention receives $835,000 from NAMB which funds 18 full time and 5 part time positions in our state and some of a bunch of programs. Well and good. I’d like to see the document. Because the document “belongs” to NAMB and because it involves “personnel information,” “confidentiality,” and stuff like that. One of my complaints about SBC stuff is that there is far, far too much that is not transparent. If folks in the pews put their dollars in the offering plate and some of those dollars go to Atlanta to the GBC, then to Nashville to the SBC Executive Committee, then back to Atlanta to NAMB, then down the road to the GBC building, then around the state to various personnel and ministries, why shouldn’t I be able to see exactly how those dollars are spent and where they go? Why is it an issue if some state staff person receives X dollars or X% of their salary and benefits from NAMB? Whose money is it, anyway? I haven’t pushed it and appreciate the manner in which my state financial guy responded to my questions…but I’d like to see the documents and details. Looks like I may have to be satisfied with seeing the Sinaiticus. Has anyone seen these Cooperative Agreements? William: One of my complaints about SBC stuff is that there is far, far too much that is not transparent. Norm: Many think that the appropriate way to understand an organization is to study its formal documents, statements, and goal structure, and to some degree one would glean useful and reasonably accurate information by doing so. But relying exclusively on this method is to dismiss the self-imposed limits to rational behavior set by management that is beyond the inescapable bounded rationality that it typically experiences. The assumption is that organizations, notwithstanding type, are really about maximizing performance. Please allow me to disabuse the reader of this assumption. While performance is an important concern, perhaps the most important, it is not the only important concern of the controlling coalition. The other concern? The controlling coalition. The less transparent the entity, the greater the degrees of freedom its leaders have and the greater capacity they have for maximizing and maintaining power. If one doesn’t have to explain decisions but to a chosen few and or have their behavior rationally constrained, given the absence of information from the many, one can make and will often make decisions that further ensures his or her control of and security in the system. All one need do is to minimally satisfy those that one is accountable to (e.g., board) and use the now increased discretionary funds to purchase loyalty, whether above or below. Whereas one can understand a good amount of organizational functioning by looking at rational factors, one will miss a significant aspect of any organization if one does not consider the ego needs of its leaders. The information that you request is available and I know of no law forbidding its public disclosure; leaders of NAMB, management and board, do not want you to have access to this information. Years ago Harvey Cox spoke about the church and how it could serve society by being a model organization, that is, its operational behavior could demonstrate, as Paul would suggest, “the better way.” Here we have just another example of it refusing the role. When we think of the principalities and the powers, should we also think of religious organizations, too? Notwithstanding our existential condition, of course not; thus why do people continue to accept the current mode of operation that conceals its internal and external dynamics? I know this is your area of expertise, Norm, and appreciate your thoughts on it, if I decipher them correctly. Whatever the logic, illogic, or rationale behind the question, as a plodding SBC pastor, I don't like the lack of simple transparence in the organization I have supported all these years. I could separate from it squawk about it. I suppose I will squawk. Someone should ask whoever gives the report at the convention what must be done to see these agreements. It seems they showed them to the GCTF... I guess that is how they came up with the information they have to make the recommendations they are making.